Place the olive oil and sliced garlic in a small sauce pan, cook over low heat until the garlic is golden brown. Stir the garlic occasionally, this may take 15 to 20 minutes. When done, strain the garlic and set aside. We will use the oil later! In a larger sauce pan place 2 ounces of the garlic oil, the onions and chili flakes cook over medium high heat until the onions are translucent. Add the red wine and reduce by half. Add the canned tomatoes, stock, olives and capers. Bring to a boil, reduce the heat and simmer for 20 minutes. Add the fresh herbs. The sauce can be made a day ahead and reheated. For the rockfish Preheat your oven to 375 degrees. Place the flour in a shallow baking dish or pie tin and season with salt and pepper. Place a large skillet over medium-high heat. Add 2 to 3 ounces of your garlic oil to the skillet. Dredge the rockfish in the seasoned flour and sear in the skillet until brown...turn the rockfish and place in the oven for 10 to 12 minutes. Let the fish rest for about 2 minutes. Serve with the sauce. 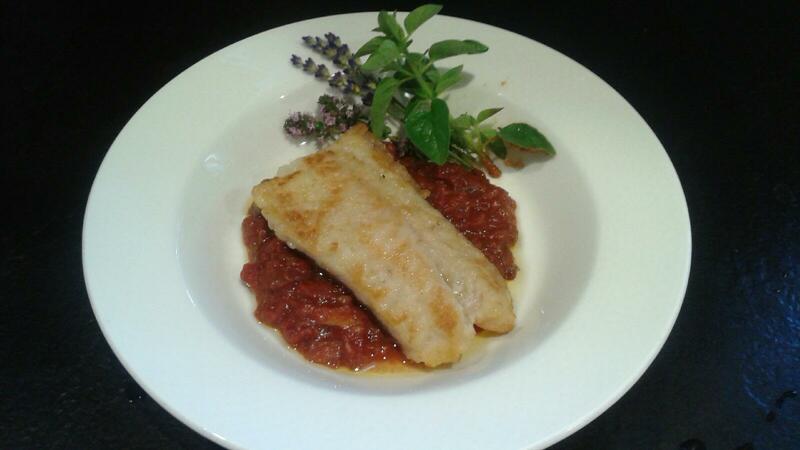 You can use any white fish in this recipe: Halibut, cod, sole...Whatever you like! Enjoy with Chateau Ste. Michelle Cold Creek Red Blend.